This trip was our first realization that David could actually work, successfully, from almost anywhere, and it changed our lives. 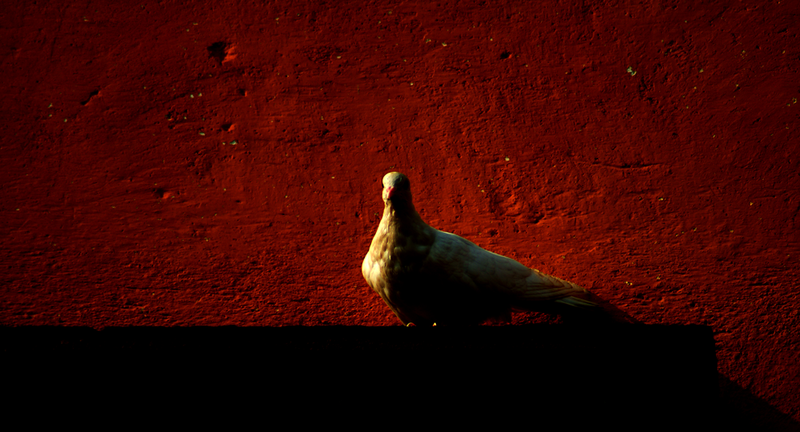 Behind the heavy wooden doors of Posadas de las Monjas we found true sanctuary. David and I have been here for 6 days and can’t seem to find a compelling reason to leave. 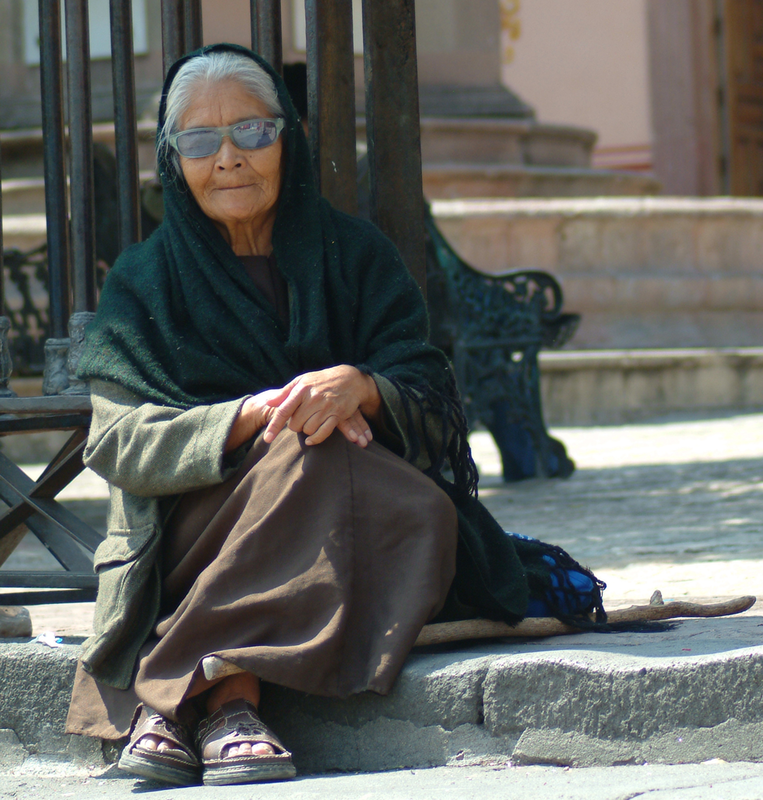 The word posada means a place to rest and rest we have found. The original buildings served as a monastery and the complex is a maze of walkways and small staircases that open into courtyards and lead up to numerous rooftop terraces. The walls are built of mortared stone with small chips of rock set into the joints for decoration. Each building is slightly different; one has arched stone moldings around the windows and others are topped by castle-like turrets. Many of the walls were left with the raw stone standing jagged at the top which adds to the medieval character. Several of the balconies are covered in white and pink plaster and edged in colorful tile. There are flowers and plants everywhere! Huge geraniums spill out of the terracotta pots lining every wall and walkway. Small pink roses emit an intoxicating perfume, blending with the jasmine and honeysuckle growing in adjacent courtyards. Fledgling doves test their wings on decorative iron railings, chirping swallows swoop down from their perches atop the tile chimneys while tiny hummingbirds dart among the flowers. This morning, we chose an umbrella shaded table on one of the many terraces as our work-space. From this spot the view is dominated by the dome of the Monks Cathedral. 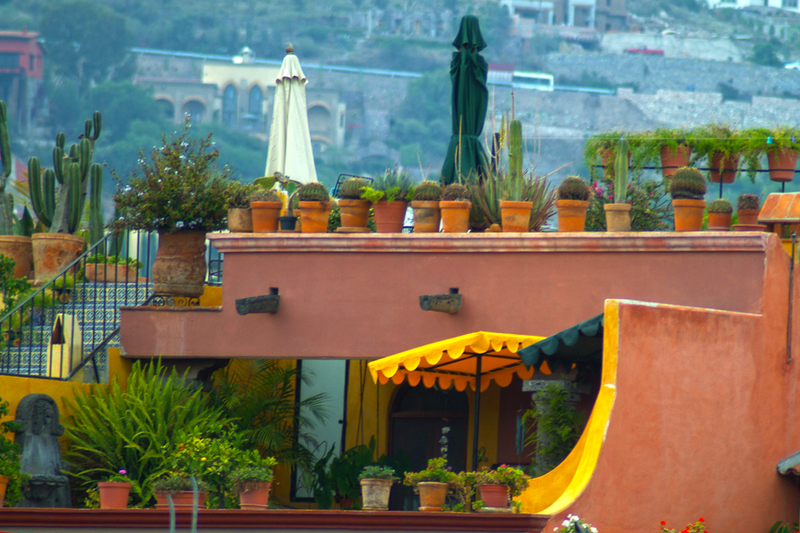 Rooftop gardens fill the scene as far as the eye can see. At first glance, the amount of color is overwhelming. This city was constructed in layers with several small dwellings built on the rooftops of others – a city above the city if you will – each having its own color scheme; so one building may be a number of colors. 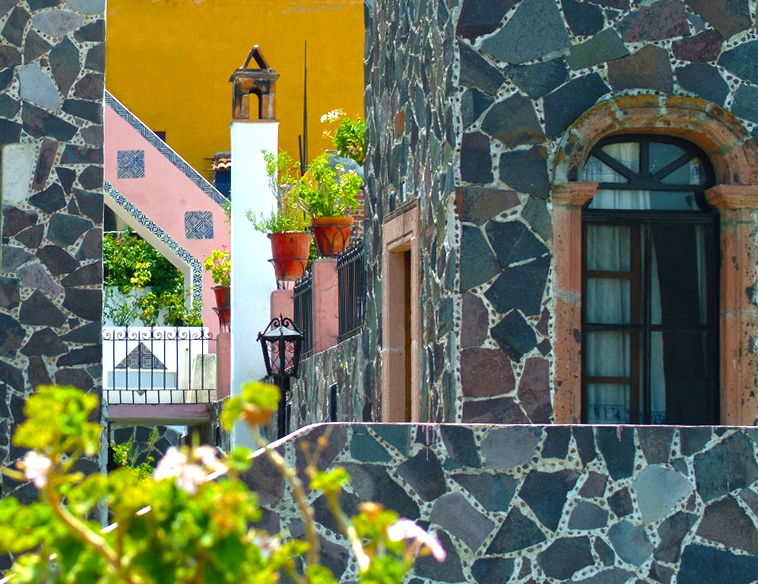 Even with the brilliant paint colors, the flowers and plants dominate the palette that is San Miguel. Look one direction and a pale yellow wall surrounds large fruit trees, scarlet bougainvillea and mimosa. On the next rooftop, there is a deep orange wall lined with brilliant yellow sheltering cactus of every imaginable shape and size. Further down, a pale orange wall, outlined in cobalt blue, hosts a hammock and dining set surrounded by flowerpots of every conceivable hue. Pale pink and lavender reside next to mustard yellow and mint green to create a range of colors almost overwhelming to the eye. All of these color combinations may at first sound garish, but they blend together like some Technicolor impressionist painting with a depth impossible to capture with words or photographs. In contrast, our room is small with a stone exterior and simple white plaster walls. The trappings are not lavish, but its comfortable bed and scarred dark wood furnishings are all that we need. Our windows are screens covered in dark wood shutters with wavy old glass panes. The overhang keeps the rain out, so we kept them open in the middle of a heavy downpour – which lulled us straight to sleep. The heating and air conditioning system consists of heavy blankets for the cool nights and a battered pedestal fan for the warm afternoons. The bathroom is decorated with hand-painted Talavera tile with a dark slate floor. A drain in the floor and a curtain serve as a shower. After the Hiltons and Marriotts of recent weeks this might seem Spartan but the simplicity is refreshing. The people here are very nice, quick with bright smiles and patient with our hesitant Spanish. There is a steady hum of work from early morning until late afternoon as they sweep, clean and tend the plants. We hear a lot of joking and laughing, whistling and singing – there is work to be done, but also a little time for play. Every morning we walk a few blocks up the hill up to the main square called El Jardin for fantastic coffee, hard rolls with jam and local butter, and a hearty breakfast at Rincon de Don Tomas. There is free WiFi from a shop on the corner so we browse the news, check email and chat with other patrons. Afterwards, we return to Posada de los Monjas for a few hours of work, then a late lunch and a short siesta. A few more hours of work and then we are free to explore the town. The sun sets about 7:30 these days and the local dinner hour is quite late, so there is a lot of time to see the area, walking for miles and taking hundreds of photographs. 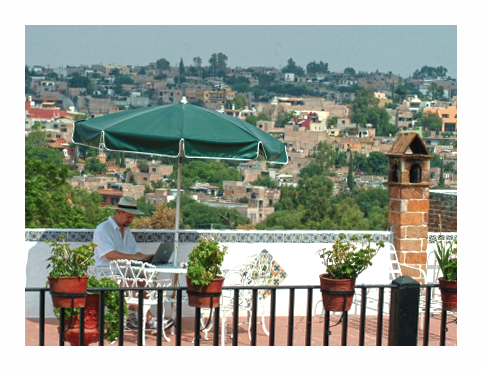 Later, we dine at one of the numerous excellent restaurants and sit in El Jardin for some people watching. Wandering back to the hotel around 11 for a last check of email and complete a few last little chores, we wrap up the day. The bars on the street below close down about midnight and after that the city quiets down considerably. However, it really doesn’t matter because with all of the walking we’ve been doing we’re out as soon as we hit the pillow – sleeping deeply at Posada de las Monjas, dreaming in the bright colors of Mexico.